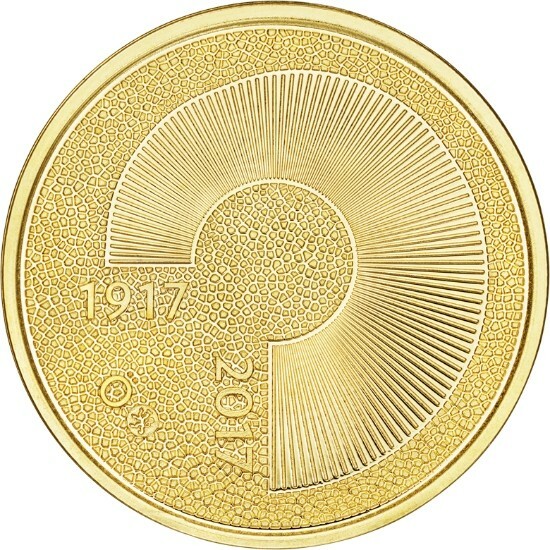 On November 30, the Mint of Finland offered a sneak preview of their new gold coin, which will be issued as part of the country’s national celebrations marking Finland’s centennial of independence. From next year, Finland will observe the country’s 100th anniversary of nationhood, which was gained after the fall of the Russian Empire during the Great War, later referred to as World War I. All collector coins released by the Mint of Finland in 2017 are a part of the Finland 100 program organized by the prime minister’s office. 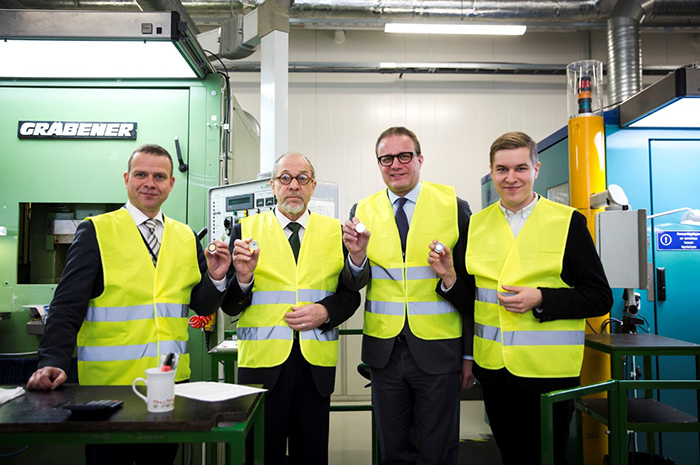 On November 30, the mint opened the centenary of Finland’s independence with a sample-minting event held in its Vantaa Minting facility. 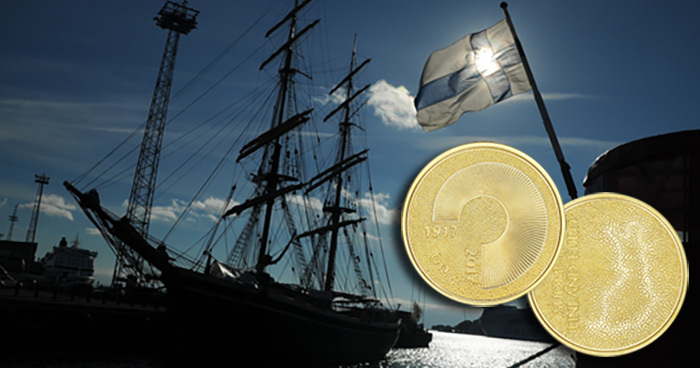 The first sample coin celebrating Finland’s centennial is minted in Finnish gold; with a nominal value of €100, it was struck by finance minster Antti Petteri Orpo and the coin’s designer, Simon Örnberg. The collector centennial coin has also been granted the Key Flag Label of the Association for Finnish Work. Samples of the Finland 100 Years collector coin produced in silver were minted by, Pekka Timonen, general secretary of the Finland 100 program, and Collector Coin Committee chairman Tapio Yli-Viikari. 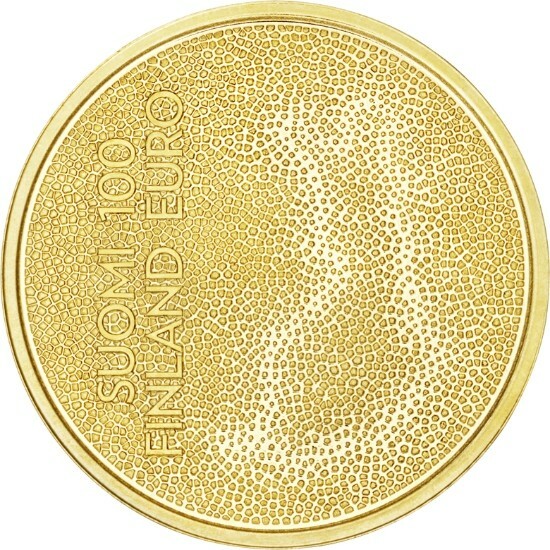 The obverse of the gold coin includes a stylized arch that represents Finland’s growing population during the last century. The years 1917 and 2017 are positioned at the beginning and end of the arch, respectively. The reverse design features a mosaic forming the cartographic image of Finland. In a vertical arrangement to the left of the image, stacked in two lines, the words SUOMI FINLAND appear next to the denomination 100 EURO (also stacked). The gold coin will be available December 14 for pre-ordering, with delivery and official release commencing January 3, 2017. The Mint of Finland’s release schedule for collector coins in 2017 will include silver coins dedicated to Finnish tango, mothers, Finland’s nature, and the golden age of Finnish art. In addition to these coins, the “Decades of Independence” series of base-metal collector coins, highlighting the achievements and challenges of Finland’s history of independence throughout 10 decades, will be launched as part of the joint Europa Star program of European mints. In August, the “Presidents of Finland” series begun in 2016 will conclude with a collector coin paying tribute to President Kekkonen. Additionally, two different commemorative €2 coins—a popular format throughout the Euro-zone area—will be released for general circulation and are scheduled for launch in 2017. The coins will pay tribute to the centenary of Finland’s independence and Finnish nature. For more information on this and other coins offered by the Mint of Finland, please visit their website. Information for the silver coin will follow shortly. Personally I think the designs are underwhelming. After 100 years you have, what’s basically a graph, to celebrate your independence? I guess Americans, like myself, expect something more grandiose. I see it….a blast of Finnish winter…and someone scraping their windshield, that must’ve been the inspiration. I had also hoped for a design which might have been more representative of the last century of Independence of this extraordinary country who have themselves become known for innovative design certainly since the end of the Second World War, perhaps a stylised version of the Coat or Arms or something similar – we’ll see if the design is popular or not in terms of sales… watch this space..!